Jr NTR recently shared the much-awaited picture of his two sons on Instagram. Recently, Jr NTR and his wife Lakshmi Pranathi blessed with the baby boy for the second time. The proud father welcomed his wife and newborn to home from hospital. The actor shared the much-awaited picture of his two sons on Instagram. Jr NTR recently made his debut on Instagram and he shares the million dollar image that is going viral. 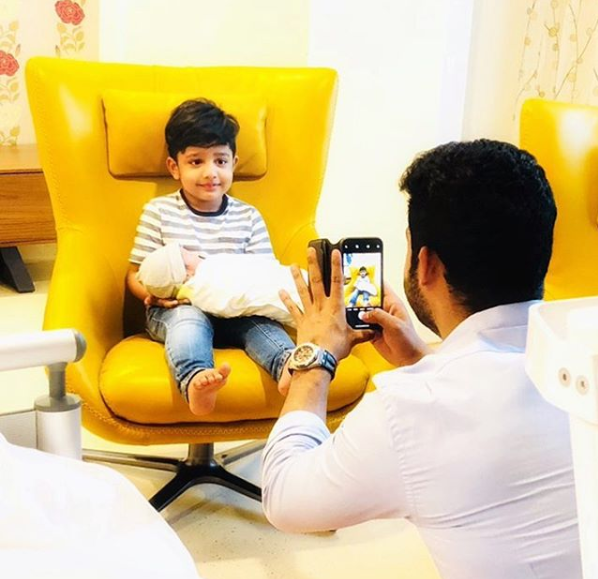 The picture sees Jr NTR’s elder son Abhay holding the little one and shared it with a quirky caption that has caught everyone’s attention. On the work front, Jr NTR is currently gearing up for his upcoming film with Trivikram Srinivas which is currently being shot in Hyderabad. The film is yet to be titled and is being bankrolled by Haarika and Haasine Creations. Jr NTR is sweating it out very hard in the gym to get into the shape for his role in the film and is being trained by celebrity trainer Lloyd Stevens who has trained the likes of Ranveer Singh, Ranbir Kapoor, and many other Bollywood celebrities. The actor will also be seen in Baahubali director SS Rajamouli’s next. The project is being called RRR which is going to be multistarrer starring Jr NTR and Ram Charan in the lead roles. The two will be seen playing the role of brothers in the film. Reportedly, Jr NTR will be seen as an elder in the role of a gangster and Ram Charan will be seen as Younger in the role of Police officer. However, there has been no official confirmation regarding the same.